The Philippine Village exhibition at the 1904 St. Louis World’s Fair included over one thousand Filipino men and women, many from indigenous tribes who were displayed in several “villages.” The Philippine Reservation promoters claimed that U.S. fair visitors could view and come to understand life in the Philippines as it was really lived. Many of the villages featured women’s work, especially the weaving of textiles and newspaper articles referred to their industrious nature. Stereographs such as this one were sold by the millions to individuals and schools for entertainment as well as education. "Domestic Arts of the Bagobos Women, in the Philippine Village, St. Louis World's Fair. Copyrighted, 1904, by T. W. Ingersoll." 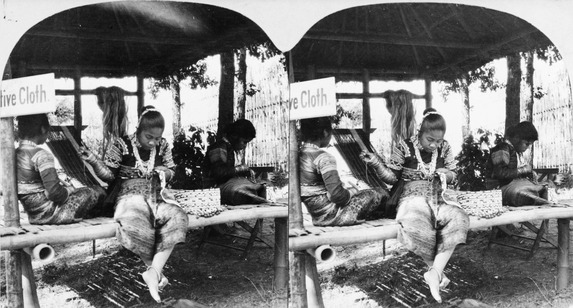 Source | "Domestic arts of the Bagobos women, in the Philippine Village, St. Louis World's Fair," black and white stereoscopic image (photograph); from Library of Congress http://www.loc.gov/pictures/item/94512206/. Cite This document | T.W. Ingersoll, “"Domestic Arts of the Bagobos Women, in the Philippine Village, St. Louis World's Fair, 1904",” HERB: Resources for Teachers, accessed April 23, 2019, https://herb.ashp.cuny.edu/items/show/1757.